African Servals - Savannah Kittens for Sale! The serval (Leptailurus serval) is a wild species of cat native to the African continent. Servals and other species of wild cats were kept as pets by humans in Egypt thousands of years ago, and they were also kept to keep the rodent populations from consuming grain stores. Ancient Egyptians considered all cats sacred animals, and killing a cat was a crime punishable by death! With a wide-ranging geographic distribution and general habitat and food requirements, servals are not considered threatened or endangered as a species. However, as with all wild animals, increasing human populations are steadily encroaching on and decreasing available habitat. Why not just have a serval as a pet? I occasionally have people email me looking for serval kittens, and I constantly discourage people from getting a serval as a pet and warn them of the many reasons this is a bad idea. Servals are an exotic (non-native) species of cat. As such, in many states, counties, or cities, servals are illegal to have as pets. Even if you did live in an area where it is legal to have a serval as a pet, many people regret trying it. Servals are large (25-45 lbs), extremely energetic, playful, and easily bored – they are frequently destructive in a home environment because they may spray or defecate, claw or chew up furnishings, possessions, or woodwork, or break or knock things down. (Imagine the damage a huge puppy could do with razor sharp claws and the ability to jump 12 feet up!). A large, secure, outdoor enclosure with appropriate shelter and environmental enrichment is essential to properly house a serval. Servals have special dietary requirements (raw meat, bones, organs, vitamin supplements), need a veterinarian who has experience with exotic cats, and require owners that are educated and experienced with exotic cats to understand their behavior and how to handle and care for them. 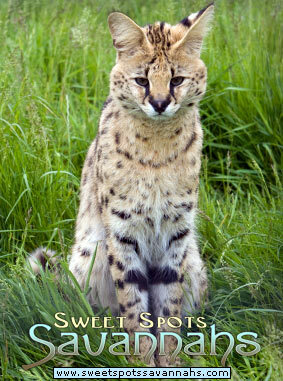 Many people buy exotic animals like servals, but find that they are not able to keep them for any of the above reasons. Then the animal is sent away from the home and family they love to a zoo, or shelter, or rescue facility, or much worse. It is extremely traumatic and some servals never recover from it emotionally. Servals bond very intensely to the people who raise them, and have a very difficult time adapting to a new home, even with another loving family. Even when they stay with the family members they grew up with, some servals (not all) become more independent when they get to be fully mature adults, and are less tame and tractable (or less likely to tolerate certain things) than when they were kittens, and may not be completely safe to interact with people directly. At this point, they may have to be placed in a licensed facility for exotic animals. It’s really not fair for any animal to go through this. A savannah on the other hand, is a beautiful, loving, gentle cat that looks similar to a serval, and has many positive serval traits, but in a smaller and domestic package that more easily fits into the normal family and home environment. In most states and localities, savannahs are legal to own without any special permits or housing.